It was a balmy evening in early December 2008 when Vicki and Dan were about to close the loan on their new home in Burbank, California. A moment filled with both excitement and anxiety quickly turned to dismay when they greeted their Notary Signing Agent — their first "real life" contact with their lending institution. She showed up with a box of paperwork under one arm, her two-year-old son wrapped in the other, and a little white Maltese at her feet. "The dog wasn't the problem, the little boy was," Vicki recalled in a recent interview. "He decided to tear through our house at full speed, and we were not child-proofed." While Dan went through the paperwork, Vicki chased after the rambunctious toddler. The Signing Agent's conduct made the title company and lender look bad, Vicki said. "If that's who they get to represent them, what other unpleasant surprises will they have for us down the road?" While this account is not indicative of the performance of all Signing Agents, Vicki and Dan's experience illustrates just how wide open and unregulated the closing table has been, and their story is not unique. "I've seen signing agents show up at the title company to drop off paperwork in hair rollers and a bathrobe," said Daniel Lewis, NNA 2010 Notary of the Year and founder of Lewis Notary Services, Inc., a nationwide mobile Notary signing service. He recalled another Notary who showed up at a signing wearing the same clothes he had on the previous day: "He looked like he was homeless." There was a time when those stories did not matter. For most of the past decade, the mortgage industry as a whole viewed what happened at the closing table as an afterthought. The industry was writing so many loans and growing so fast, it didn't seem to matter whether the Notary at the signing table did the job well or provided good customer service. Now it matters. Since the 2008 housing market collapse, sweeping reforms have filtered their way through just about every part of the loan origination industry. With mortgage brokers and appraisers now being subject to much tighter scrutiny and higher standards, Notaries — and specifically Notary Signing Agents— will be held to higher standards of training, compliance, and professional conduct than ever before. Gone are the days of showing up late for a signing, or rushing signers through paperwork in order to pick the kids up from soccer practice. In the very near future, Signing Agents will likely be required to attain higher levels of training or certification, will be subjected to more stringent background checks, and assure compliance with both state and federal regulations. Serving on the forefront during one of the most important financial transactions a person or family can make, Notaries have the power and responsibility to ease homeowners into their slice of the American Dream. Being an NSA comes with unique and awesome responsibility, one that should never be taken for granted. "Notaries offer a very important service," said Utah Attorney Peter Stevens, an expert in regulatory initiatives affecting Signing Agents. "But the moment they let their standards slide or step outside the scope of their authority, there's going to be pushback. If they perform properly and professionally, they'll likely avoid over-regulation." Up to this point, the most significant new regulatory trends — including the $25 billion National Mortgage Settlement levied against the nation's major financial institutions, the finance and banking regulations set forth by the Dodd–Frank Wall Street Reform and Consumer Protection Act and other federal legislation, as well as the initiatives of major federal agencies — have focused on individuals and organizations higher up in the loan processing "food chain." There now is a nationwide licensing requirement for mortgage brokers, for example. Dodd Frank also created the Consumer Financial Protection Bureau, which is creating rules to regulate mortgage transactions at all levels. Notary Signing Agents, as an essential part of the process, are rapidly being wrapped into these necessary reforms. For Signing Agent Nathan Ganeshan, owner of Northern California-based Nathan's Notary mobile signing service, one of the biggest changes has been an increase in additional loan paperwork. While major lenders have remained standard in their requirements, he estimates he's seen 30 to 40 percent more paperwork from many third-party and private lenders. "We're seeing a lot more documents overall," says Ganeshan, "with each lender having different requirements to protect themselves. Some require more disclosures, some mortgage documents require FBI verifications, still others require occupancy affidavits." One major mortgage lender, for example, recently started requiring Signing Agents to complete a "notarial evidence" form with all mortgages that includes the Notary's name, commission number and expiration date as well as the names of all signers at the loan signing appointment, the method used to identify them and the loan number. Clearly, NSAs need to know what to expect from lenders or title agencies in order to perform their role diligently. But where should that knowledge come from? Will each lender handle its business differently, leaving it to the Signing Agent to decipher the document requirements, or will there be some sort of uniform standard created across the board, making compliance an easier task for all parties? Who will be tasked with creating this standard — will it require government intervention, or is it possible for the industry could regulate itself by establishing its own rules and a code of conduct for all Signing Agents to follow? Al Verkuylen, Senior Vice President of LSI Title Company, told a gathering of hundreds of Signing Agents at the NNA's 34th Annual Conference last June that federal regulators have started looking closely at settlement and closing practices of third-party vendors such as title and closing services, with special focus on the Notary process. One of the biggest challenges the industry faces is the wide disparity of notarial laws and regulations from state to state. Some states, for example, require individuals to undergo training, testing and background checks before obtaining a Notary commission. Other states merely require a Notary to complete an application and pay a fee. Under the current regulatory environment, however, banks with a multi-state presence need to manage their outside contractors in a consistent, uniform manner. Consequently, as Verkuylen noted last June, a number of major lenders had begun exploring ways to create a centralized training and certification process for Signing Agents that would comply with federal regulators. Lewis and others embrace the idea of a national standard for NSAs. "I think a nationwide code of conduct is much needed and would greatly benefit the industry," Lewis said. "Other professions have them, like doctors and lawyers, and they're very helpful to improve communication between signers, vendors, and Signing Agents." With the rapid changes in the regulations in the signing industry, a code of conduct, issued from a reputable industry organization or the National Notary Association would definitely help, Ganeshan said. While a uniform code of conduct could address the government's mandates, the new mortgage industry environment involves far more than regulatory compliance. Lenders now recognize that, with increasingly centralized loan origination operations, the Signing Agent often is the primary face of the bank with the borrower, so they are scrutinizing the customer service experience at the closing table. As a result, the notion of Signing Agents as true professionals is gaining wider traction across the industry. That's particularly true as the industry gradually rebounds from the recession and foreclosure crisis. 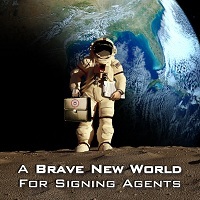 Already, the industry has indicated that there is a growing need for well-qualified Signing Agents — with an emphasis on well-qualified. Many signing services are responding. Daniel Lewis, for example, carefully vets every potential new NSA for his nationwide signing company. "They need to meet basic standards, first," Lewis said, but the vetting process doesn't end there. "We like to hire Notaries who attend professional conferences, take training courses, become certified, and find ways to demonstrate a real commitment to their careers. We are raising the bar, because title companies are expecting much more these days from Signing Agents." In order to ensure compliance, financial institutions, third party lenders and title companies are paying a lot more attention to who they hire. They want Notaries who are educated and competent in their role, who show up looking professional and ready to perform their role with confidence, and who can be counted upon to represent their company in a positive manner. "The word professionalism does not just mean getting all the documents signed properly," Ganeshan said. "It starts from the time a Signing Agent is contacted for the appointment and remains until the close of escrow." It also helps to stay educated on the industry itself, says NNA 2008 Notary of the Year Liz Adams. "You need to know your industry and keep in the know for any changes that are occurring, so that you will not be behind the curve," said Adams, who built her own signing business and continues to mentor the growth of Notaries nationwide. Daniel Lewis echoes Adams' focus on knowledge. "You have to always stay teachable," he said. "You can't sit around waiting for the phone to ring with more business. You have to be open to learning and improving the way you do things." Lewis encourages NSAs to join professional associations, such as their state's land title association or the Mortgage Bankers Association, in order to better understand the views of those organizations and the directions they are going, so as to avoid being surprised or left behind by industry shifts. He also emphasizes the value of Notaries helping and mentoring one another. "If a Notary works outside of prescribed guidelines or makes serious mistakes, it can negatively impact the entire profession," Lewis said. "If enough Notaries perform poorly, it's more likely that laws will be made restricting everyone." That's why Notaries should take it upon themselves to develop a culture of education, compliance and professionalism, he said. "It'll show other industries that we take our profession seriously, and they, in turn, will take our profession seriously."